我反而同妳相反~ 以前喺香港對節日只係例行工事，可能家人喺身邊日日對住，會有d take it for granted; 而家反而會重視，所以父親節母親節就算陪唔到V爸爸V媽媽，我都會送花送咭! Mr. T really 扮甚麼似甚麼! 勁! Hi V！你好呀！我read左你個blog都有2 年多啦！本來我都無想過會流言的，因為我無blog account，但原來今容易開。。。剛剛終於開左！其實我想同你講這兩年read你的blog已經成為我的relax 方法，我本來住係Vancouver後來畢業翻左香港工作。所以有時見到你post d 相，都會領我想翻係Vancouver好開心的日子呢！我喜歡read你個blog，係因為你發放好多開心同正能量的message. 無論係你去shopping or 你同Mr. T 去吃飯，見到你好開心，有時我本來吾開心都會開心翻d! 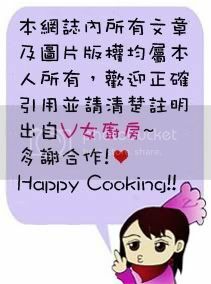 你的開心同幸福係會感染其他人的！Keep up your good work and stay happy all the time! By the way! I have to say thank you to you for introducing the 65c bread baking book! Also, I've tried many of your recipe and they all taste very good! This is my first blog message...... hope talk to you soon!!! [版主回覆06/24/2013 04:49:35]係架~ 我娘家人 + 夫家人都臥虎藏龍架!